With Checkmate’s HCM solution, you can integrate directly with USCIS’ E-verify system to obtain instant employment eligibility verification. 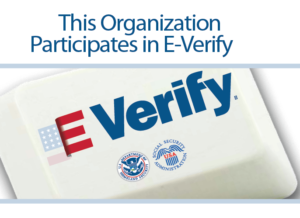 In addition to completing I-9 forms as part of verifying a new hire’s employment eligibility, many states require or have pending legislation that will soon require also submitting information through USCIS’ online E-Verify system; all federal contractors are required to use E-Verify. E-Verify does not replace the requirement to complete I-9 forms for new employees, but it does provide additional peace of mind knowing you are hiring eligible individuals in compliance with your state and federal laws. The information is stored directly in the employee’s record in the Workforce Ready system.